Get in demand with an online bachelor's degree in computer science. With a Bachelor of Science in computer science from University of Maryland University College, you'll be able to plan, design, and optimize computer software and hardware systems for commercial and government environments. 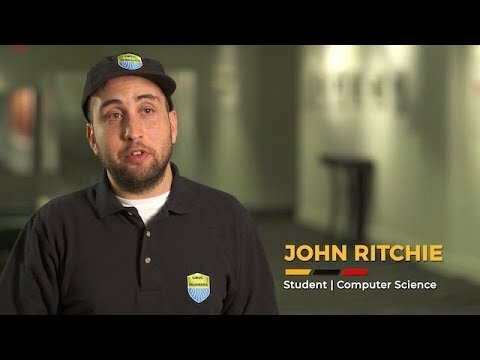 In the online bachelor's program in computer science, you'll learn programming, algorithm optimization and enhancement, and the theory, science, and math behind modern computing. Specifically, you will learn about Java, C++, OpenGL, Octave, and MATLAB. Your courses will include data structures and analysis, computer systems and architecture, image and signal processing, and more. The bachelor's degree in computer science requires 42 credits of minor and/or elective coursework. This program is designed to help provide you with a foundation for a career in software architecture or engineering, application software design, or systems analysis, programming, or engineering in corporate organizations and government agencies. We recommend you have previous professional programming experience or experience programming as a hobby. I work as a systems administrator at NASA Goddard Space Flight Center. I manage and support hundreds of computers and users. At my job, I apply the computer programming knowledge that I gained from UMUC. I am better able to understand existing code and implement new scripts for managing computer systems. I now have a deeper understanding of the IT infrastructure as a whole. The classes were not always easy—some of them were real struggles. . . . But I know without my UMUC degree, I'd be struggling a lot harder! John Ritchie is grateful for UMUC. His degree program in IT & Computer Science is opening new windows of opportunity, even while being a student. For alum Lt. RJ Niesen, having his family all together at commencement after months of deployment made everything worth it. Duane Jarc began teaching full-time at University of Maryland University College in 1987 after spending 15 years as a software developer, primarily with General Electric. He earned a BS in mathematics and an MS in computer engineering from Case Western Reserve University and a DSc in computer science from the George Washington University. He teaches courses in programming, discrete mathematics, algorithms, and compiler theory and design. He received the UMUC Stanley J. Drazek Teaching Excellence Award in 2009. James Robertson joined University of Maryland University College in 2001 after serving as a principal consultant at Oracle. He earned an MS in electro-optical engineering from the University of Dayton and an EdD in instructional technology from Towson University. He teaches courses in programming, databases, computer graphics, and image and signal processing at UMUC. He also presents papers and participates in technical discussions at conferences across the United States. Prerequisite: CMIS 141. Further study of the Java programming language. The objective is to design, implement, test, debug, and document Java programs, using appropriate development tools. Topics include object-oriented design, event-driven programming, exceptions, recursion, arrays, and data structures. (Not open to students who have completed CMSC 311.) Prerequisite: CMIS 115, CMIS 125, or CMIS 141. A study of the fundamental concepts of computer architecture and factors that influence the performance of a system. The aim is to apply practical skills to computer systems architecture. Topics include data representation, assembly language, central processing unit architecture, memory architecture, and input/output (I/O) architecture. Students may receive credit for only one of the following courses: CMIS 270, CMIS 310, CMSC 311, or IFSM 310. (Intended as a final, capstone course to be taken in a student's last 9 credits.) Prerequisite(s): Either CMSC 330 and CMSC 335, CMIS 320 and CMIS 330, or SDEV 425. An overview of computer technologies, with an emphasis on integration of concepts, practical application, and critical thinking. The goal is to research, plan, conduct, and complete collaborative computer-related projects in compliance with schedule deadlines. Analysis covers innovative and emerging issues in computer science. Assignments include working in teams throughout the analysis, design, development, implementation, testing, and documentation phases of the projects, including periodic peer reviews. Prerequisite or corequisite: MATH 140. A survey of fundamental mathematical concepts relevant to computer science. The objective is to address problems in computer science. Proof techniques presented are those used for modeling and solving problems in computer science. Discussion covers functions, relations, infinite sets, and propositional logic. Topics also include graphs and trees, as well as selected applications. Students may receive credit for only one of the following courses: CMSC 150 or CMSC 250. Prerequisite: CMSC 230 or CMSC 350. A comparative study of programming languages. The aim is to write safe and secure computer programs. Topics include the syntax and semantics of programming languages and run-time support required for various programming languages. Programming projects using selected languages are required. Prerequisite: CMSC 230 or CMSC 350. A study of object-oriented and concurrent programming using features of Java. The goal is to design, implement, test, debug, and document complex robust programs in an object-oriented language. Concepts of object-oriented programming (such as composition, classification, and polymorphism) are explored. Topics include the principles of concurrent programming (such as task synchronization, race conditions, deadlock, threads, and event-driven graphic user interface programs). Programming projects are implemented in Java. Students may receive credit for only one of the following courses: CMSC 300 or CMSC 335. Prerequisite: CMIS 242. A study of user-defined data structures and object-oriented design in computer science. The aim is to develop secure Java programs. Topics include linked lists, stacks, queues, arrays, maps, vectors, and trees. Algorithms that perform sorting, searching, and recursion are discussed and analyzed. Prerequisite: CMSC 325 or CMSC 350. A hands-on, project-based introduction to computer graphics. The goal is to develop projects that render graphic images and animate three-dimensional objects. Topics include programming in OpenGL and transforming, viewing, and modeling 2-D and 3-D objects. Prerequisite: CMIS 310 or CMSC 311. A study of the fundamental principles underlying modern operating systems. The objective is to design and implement a small-scale operating system and design a virtual memory management system. Discussion covers the essential components of a typical operating system and the interactions among them. Topics also include methods of managing processes and resources in computer systems. A programming project that implements part of an operating system is required. Prerequisites: CMSC 330 and programming experience in C or C++. An examination of the formal translation of programming languages, syntax, and semantics. The goal is to write programs that are constructed using program generators. Topics include evaluation of finite-state grammars and recognizers; context-free parsing techniques, such as recursive descent, precedence, LL(K), LR(K), and SLR(K); and improvement and generation of machine-independent code and syntax-directed translation schema. Programming projects that implement parts of a compiler are required. Prerequisites: CMSC 150 and CMSC 350 (or CMSC 230). A presentation of fundamental techniques for designing and analyzing computer algorithms. The aim is to apply Big-O estimates of algorithms and proof-of-correctness techniques and to design algorithms. Basic methods include divide-and-conquer techniques, search and traversal techniques, dynamic programming, greedy methods, and induction. Programming projects are included. (A continuation of MATH 140.) Prerequisite: MATH 140. A study of integration and functions. The aim is to demonstrate fluency in the language of calculus; discuss mathematical ideas appropriately; model and solve problems using integrals and interpret the results; and use infinite series to approximate functions to model real-world scenarios. Focus is on techniques of integration, improper integrals, and applications of integration (such as volumes, work, arc length, and moments); inverse, exponential, and logarithmic functions; and sequences and series. Students may receive credit for only one of the following courses: MATH 131, MATH 132, or MATH 141. Prerequisite: CMIS 242, CMIS 215, or CMIS 225. A hands-on study of best practices and strategies for building secure applications for the web. The objective is to defend against web application vulnerabilities. Topics include web application architecture, common threats and trends, cross-site scripting, SQL injection, input validation, and business logic flaws.